Tickets to the upcoming season of the Hollywood Bowl go on sale this weekend, and while we're incredibly excited about the lineup this summer, we're also chomping at the bit—literally—for the food. 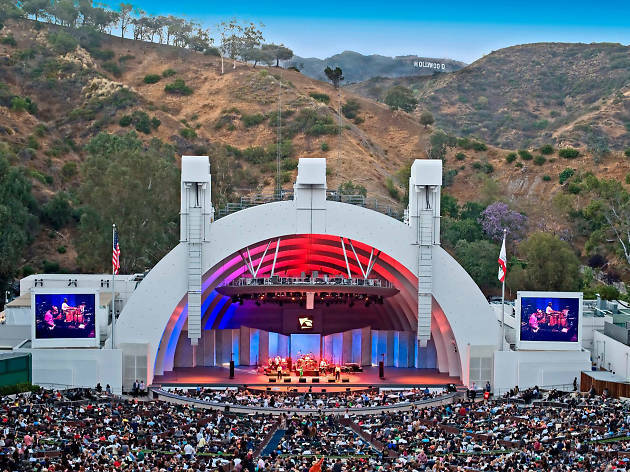 After years of seeing Patina cater the food and beverage, Suzanne Goin and Caroline Styne have signed a 10-year deal to curate the Hollywood Bowl's dining and drinking options. We stopped by the Bowl's opening party on Monday for a sneak peek at what concert goers will be eating this season. A couple concession stands outside the stage are concepts straight from Goin and Styne's empire. The Wine Bar by a.o.c. features curated cheeses, charcuterie, salads and meats, along with craft beer, soju-based cocktails and a wine list curated by Styne. Marketplace is an ode to Larder, where you can grab hot entrées (we're excited about the beef brisket and mac and cheese), picnic-friendly sandwiches, cheese plates and treats from the Larder Baking Company. If it's Lucques you're after, Lucques at the Circle is available to subscribers of the Pool Circle, offering a seasonal made-to-order menu (think: grilled pork chops with cornbread stuffing) along with an impeccable wine list. The backyard, a new al fresco space with wood-burning grills, will offer more of Goin's food: grilled fish, steaks, greens and a raw bar. 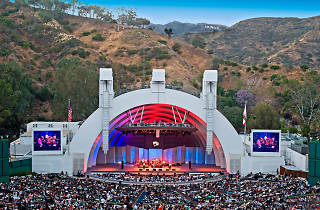 Another addition to the Hollywood Bowl this season is food trucks. Wood-fired pizza, fish tacos and rotisserie chicken will be available in the main plaza and walkways, as will street food and snacks (we sampled a bomb banh mi that we can't wait to wolf down before seeing Sufjan Stevens). A roadside burger stand, sushi bar and Supper in Your Seats round out the food options. While Styne curated most of the wine selection, WINC (formerly ClubW) also worked with the accomplished sommelier to provide wines on tap at the concession stands—another first this year. Summer Water Rosé from Santa Barbara is the kind of wine that you'll find yourself drinking three glasses of before you know what hit you. Also on tap: Folly of the Beast Pinot Noir, which would pair nicely with a wood-grilled pizza or that rotisserie chicken. As always, you can bring your own food and wine for a DIY picnic on the outside lawn—though with food this tempting, we suggest leaving the cheese plates up to the professionals.